Every summer, on Tuesdays, Knitty City hosts free Knitting at Bryant Park. Knitters of all levels are welcome to join. Finished squares are put together to make blankets and donated to charity. 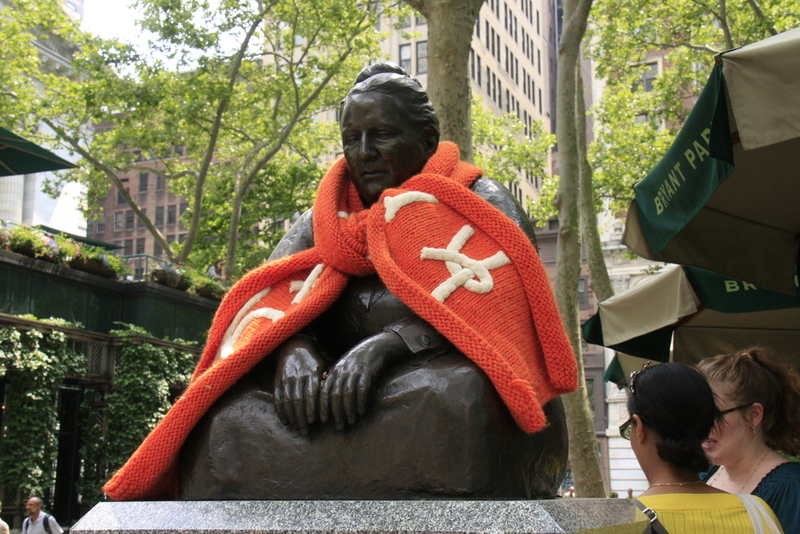 Gertrude Stein modeling the Knitty City banner as a scarf. Knitty City's little mascot is always hanging out around the shop. Winter 2015 can't end soon enough. We've decorated our window appropriately for St. Patrick's day and to welcome Spring. Featuring Tomoko's handcrafted cat dolls and miniature piano. 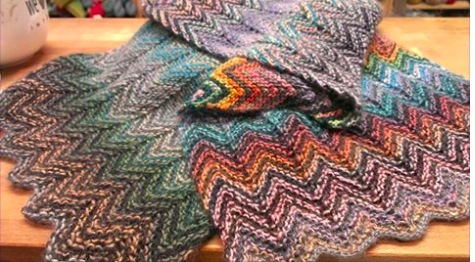 We also have on display Nancy Ricci's latest pattern, Bethesda, from Malabrigo Book 8: In Central Park. Johanna Johnson is presenting her new book, Phoebe's Sweater. July 2012. Miniatures of some of the Knitty City bags through the years by June. 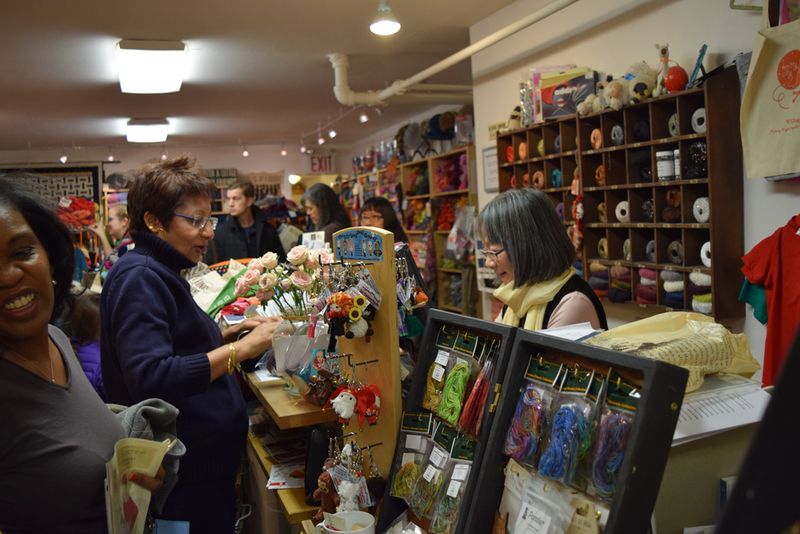 Assorted "knit knacks" at Knitty City. 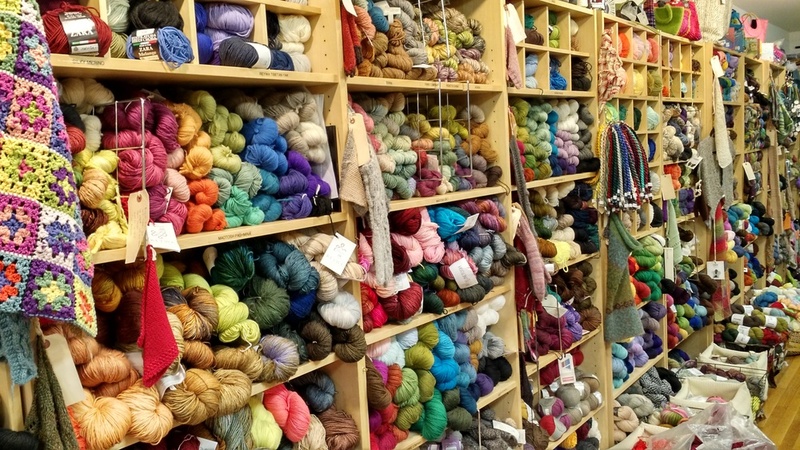 Some of the shelves at Knitty City. 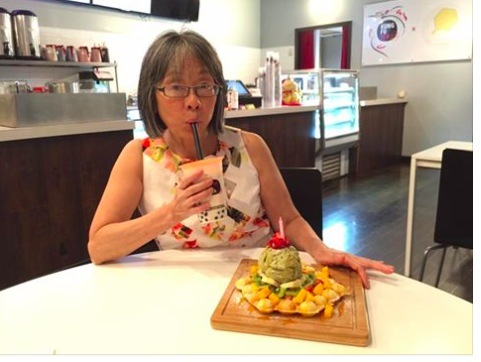 Melanie Falick's Petunia is enjoying our 6th anniversary almost as much as we are! Knit your own dinosaur from Melanie Falick's Knitted Dinosaurs book. January 2012. 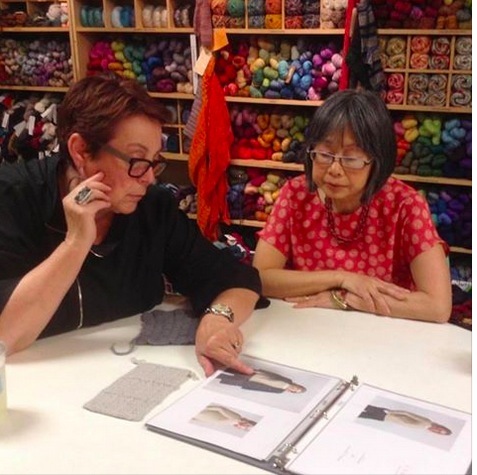 Kathleen brought in a whole wardrobe of her designs for guests to admire and try on. January 2015. Toby Roxane talking about her design process and having an impromptu modeling session. April 2015. Xuanxuan is making full use of our table space to lay out the dozens of fabrics samples from her senior thesis at Parsons the New School for Design. June 2015. We're showcasing two dresses designed by Xuanxuan Li. 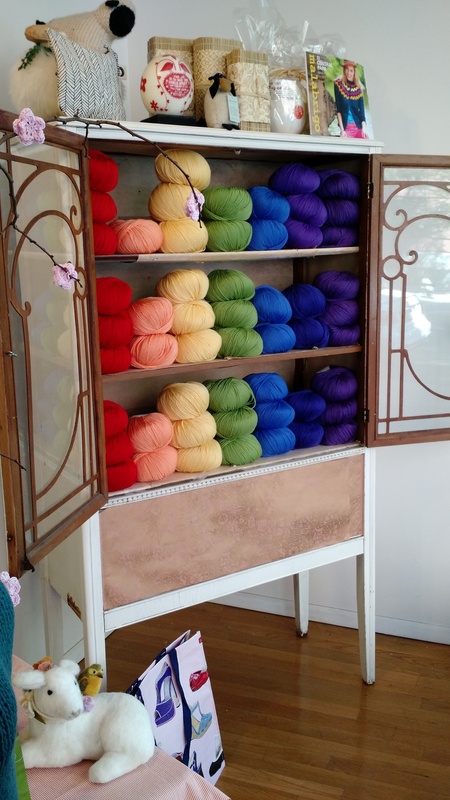 In celebration of spring, they're being complemented by our floral themed window with flower blossoms crocheted by Jenny. Xenobia is showcasing some of her mosaic designs that will be on display in the upcoming MTA 7 subway station on 34th St. May 2015. Friends of Alphonse Poulin say farewell and celebrate his retirement. 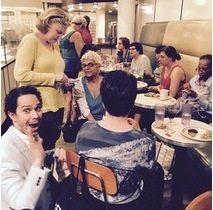 You'll always have a seat ready when you come back to New York! May 2015. We've been getting a lot of rain in New York lately, but remember: No rain, no rainbows! It's an especially beautiful day out in Bryant Park as we celebrate the 10th anniversary of World Wide Knit in Public Day. June 2015. Knitting never goes out of season. Pam Allen's Togue Pond pattern (available on Ravelry.com), knit with Lang Sol yarn, is the perfect summer time project. Things are bustling on our 10th Anniversary! January 2016. Lars Rains' Modern Lopi is an exquisite book filled with patterns for Icelandic wool. On the back cover you can see another Knitty City guest, Toby Roxane, modeling for the book. February 2016. Nancy's hearts workshop is right on time for Valentine's Day. February 2016. 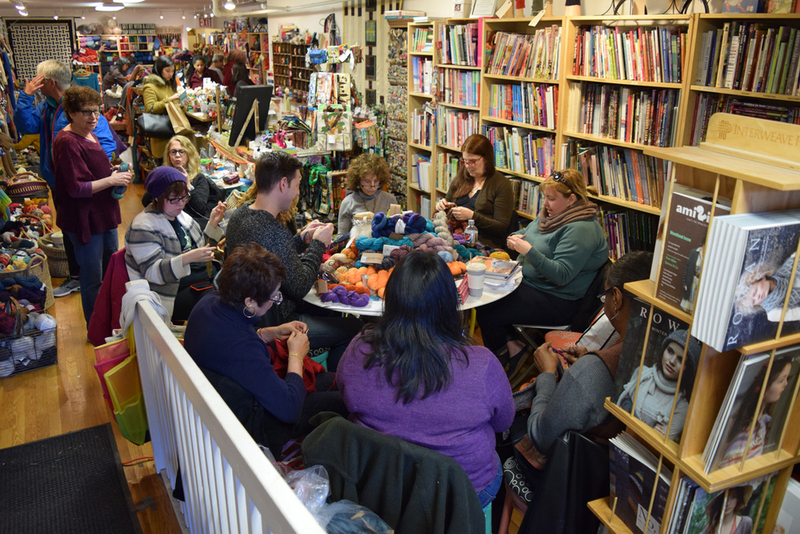 Sometimes we don't have table space for everyone, but that never stops our customers from grabbing a chair and taking out their knitting. January 2016. Just the usual suspects sitting back with their knitting. February 2016. We love all of Susan B Anderson's "Itty-Bitty" knits and her newest pieces from "Kids Knitting!" Pearl is showing off one of our fabulous Knitty City totes in the beautiful tropics. July 2011.